My second favorite thing to do with raw milk besides drinking it is making kefir. The tangy probiotic rich drink is something I often use in smoothies. It pairs quite well with strawberries. I cut my strawberries in half before freezing to ease the blending. A few small chunks of frozen strawberry snuck past the powerful blades of my Blendtec, which I kind of like. Enjoy! 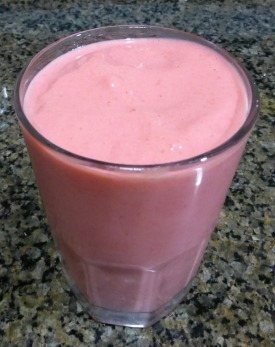 I would love to know if you try this super strawberry kefir smoothie – please leave a comment below. Happy Blending! Great smoothie❣I didn’t have blueberries at hand so used banana instead and added maca and goji bears as well. Love it. Thanks for all your smoothie shares❣ We use your recipes often if not most of the time. Nice to hear you enjoyed this smoothie and many of my other recipes, Marita :) Banana, maca, and goji berries were excellent add-ons.